In December, Dubrovnik turns into a Christmas tale, while thousands of lights and Christmas decorations enhance its astonishing beauty. 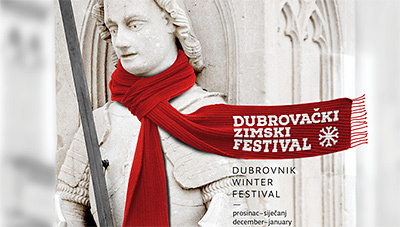 The unique holiday experience is enriched by the Dubrovnik Winter Festival, a project by the City of Dubrovnik, Dubrovnik’s public cultural institutions, the Dubrovnik Tourist Board and public companies, featuring a variety of cultural and entertaining vents organised in several locations in the Old City and other parts of Dubrovnik during Advent and the period preceding New Year’s Eve Party. Taking place on Saturday, 2 December 2017, the 4th Dubrovnik Winter Festival Opening Ceremony will include the 1st Advent candle lighting and the holiday illumination switch-on. Shop windows in the Stradun will also be decorated in a special way this year, thus enhancing the overall holiday atmosphere and becoming part of the winter magic. In the Stradun, the world’s most beautiful open-air stage, a memorable New Year’s Eve Party featuring Croatia’s most popular singers will be organised, as well as a spectacular concert of the regional star Dino Merlin. An extensive children’s holiday programme in Teddy Bear Park at Pile has been organised, while other parts of the city will also shine in their magnificent holiday attire. Occasional festival programmes will be organised in Mokošica, especially on Sundays, and in the Bay of Lapad where an ice skating rink will be set. Savour Christmas delicacies on offer at kiosks in the squares and streets of Dubrovnik, and sing traditional Christmas songs and carols in the Stradun on Christmas Eve and New Year’s Eve, wishing everyone happy holidays!